What can I say about Beauty? I still have mixed feelings about this book after finishing it 4 days ago. I didn't hate it, but I certainly didn't love it either. It was different. On her sixteenth birthday, Beauty, daughter of the Duke of Westfaire, sidesteps the sleeping-curse placed upon her by her wicked aunt - only to be kidnapped by voyeurs from another time and place, far from the picturesque castle in 14th century England. She is taken to the world of the future, a savage society where, even among the teeming billions, she is utterly alone. Here her adventures begin. As she travels magically through time to visit places both imaginary and real she eventually comes to understand her special place in humanity's destiny. The basic theme of the book is how humans are ruining the planet...that the things we are doing are dooming us to a world where the planet can't sustain us and everyone is forced to live off tablet food in tiny cubicles, and people are incinerated every day because there are just too many of them. Gruesome huh. Beauty is fading from the world. 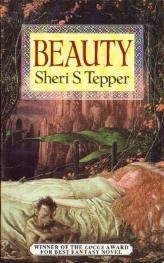 The author incorporates well known fairy tales into to the narrative to weave the story of Beauty and I quite liked that. It was interesting to see which fairy tale she was going to include next. The thing I didn't like was it's preachiness. There were quite a few times where you get the point she is trying to make and then she just keeps going. It's at those times I find the voice stopped being Beauty's, a girl from the 14th century, and became Tepper's own voice and it was annoying. I also found a few times that the author negated the point she was trying to make about the rotten things that are in books and movies by repeating those same things, which to me was a little hypocritical. That's why it then surprised me to find out that Tepper has also written crime and horror novels. Hmmmm. I am firmly on the fence with this one. It's a very good story and very well written. It was just ruined for me by the constant unashamed preaching on the environment. I can't give this a Thumbs Up or a Thumbs Down. They both cancel each other out. As I said...I'm on the fence. Give me some preaching on environment anytime!